Knowing how to cook an egg can be a real bonus for your health, time, and pocket. It has now been shown that eggs really are good for us as they are high in protein and packed full of nutrients. Eggs are also delicious, quick to prepare, and inexpensive. Many people have been put off eggs for life through bad cooking experiences. Raw soft-boiled eggs, scrambled eggs that taste like rubber, or green hard-boiled eggs donâ€™t leave you wanting more. Follow these basic methods to produce eggs that wonâ€™t leave you disappointed. Eggs keep for longer when they are stored in the refrigerator. Soft-boiled eggs, hard-boiled eggs, and poached eggs, however, should always be at room temperature to get the best results. The quickest way to bring eggs to room temperature is to place them in a bowl of lukewarm water for five or ten minutes. Donâ€™t use hot water as the eggs may start to cook. As a general rule, if you place your eggs in tepid water they will be ready to use by the time your cooking water is starting to boil. To test for freshness, place the egg in a bowl of water, adding a little salt if you wish. A fresh egg will sink while a bad egg floats, i.e., sink=safe, float=forget it. Quite often an egg will sink but then point its nose up. Use your own judgment here. An egg that has left the bottom of the pot is past its best. A slow tipping egg is probably still ok to use, but it may be best incorporated into other dishes rather than used in a stand-alone egg dish. Tip: If an egg bounces in the water throw it away. Put enough water in a pot to cover your egg/s and add a little salt. The salt will stop any egg running out, if it should crack. Cracking is usually caused by either the egg being too cold or the water too hot. Bring the water to almost boiling point, aiming for a good amount of bubbles but not a full boil. Use a spoon to gently place your egg/s into the pot. Bring the water to full boiling point and boil for three minutes. If you like runny whites, take the eggs off the heat sooner. Eggs continue to cook when removed from the heat. As soon as you take the pot off the element, tip the hot water out and refill with cold. This stops any further cooking. Method 1: Cook eggs for 10 minutes as for soft-boiled eggs. Place the egg/s in a pot and cover with cold water. Bring the pot to a boil, uncovered, and boil for about 2 minutes. Turn off the heat and cover the pot. After 10 minutes remove the pot from the element and pour in cold water. Tip: Fresh hard-boiled eggs are harder to peel than older ones. Crack the eggs all over before peeling and, if necessary, run them under cold water while peeling. Put enough water to a frying pan to cover the egg, which must be at room temperature, adding a little salt or vinegar. Heat the water until it is just simmering but not boiling. 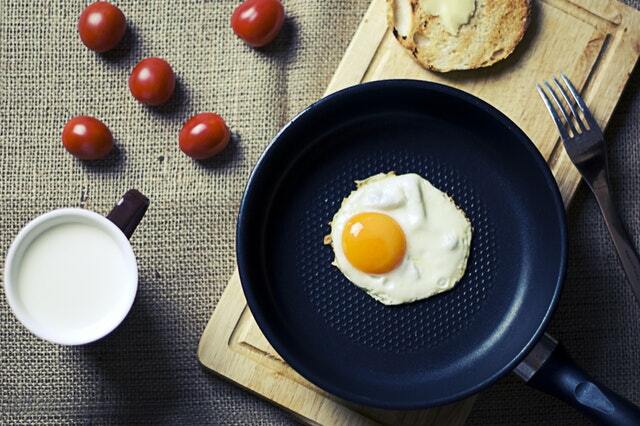 Carefully break the egg into the pan. This is a good time to pop your toast into the toaster. Spoon water continuously over the egg as this encourages even cooking. Take the egg out of the water before it looks ready, especially if you like a runny yolk, as a poached egg will continue to cook after it is removed from the pan. Tip: For a change, try a little mint sauce over a poached egg. Eggs under mushrooms or over spinach can also make an interesting change from plain toast. Break eggs into a bowl and add salt and pepper to taste. A little milk can be added too, if you wish. You donâ€™t need to worry too much about the starting temperature with scrambled eggs. Heat a frying pan on a low to medium heat and add a little butter or unsaturated oil. Once the butter has melted, pour in your egg mixture. Stir the eggs continuously until they start to resemble scrambled egg. Take the eggs off the heat before they look fully cooked. Remember, eggs keep cooking off the heat and you will end up with rubber if you donâ€™t remove them in plenty of time. Tip: Scrambled eggs are delicious with a little grated nutmeg, grated cheese, or even chili sauce on top. Fried potato with herbs and scrambled eggs also makes a cheap and filling dish. Now you know the basics of cooking eggs it is time to go and experiment. Eggs are good for you and easy to cook. Who knows, you may even decide to keep your own chickens for an endless supply of cheap eggs.